The Centerline Editor allows you to tweak and reshape brush strokes by manipulating their center line rather than their contour. This gives you a flexibility that is similar to the one you have when using the Contour Editor tool to manipulate pencil lines. In Harmony, pencil lines are vector information calculated by their center line and the width of the line. This makes it easy to edit pencil lines with the Contour Editor. Brush strokes, however, are stored as shapes. Therefore, using the Contour Editor on a brush stroke does not allow you to edit the center line of the stroke, but rather, its contour. 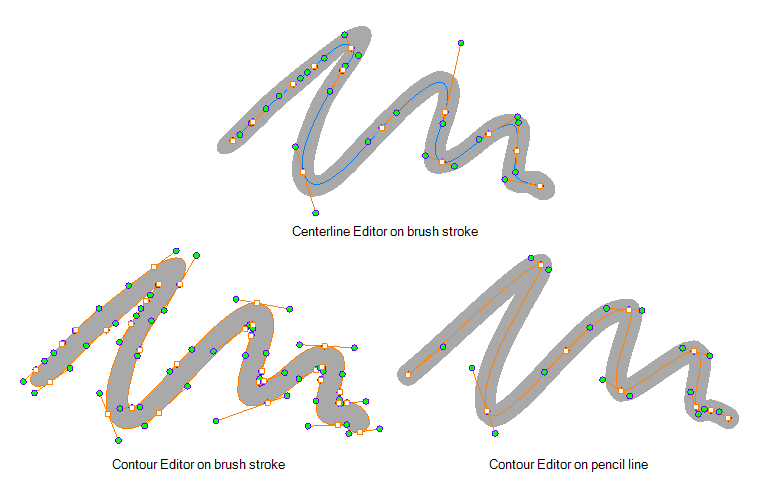 The Centerline Editor tool creates a center line for a brush stroke, and gives you access to control points and Bezier handles for this center line, allowing you to deform the brush stroke the same way you can deform a pencil line using the Contour Editor. Keep in mind that brush strokes are vector shapes with a fill. As such, the Centerline Editor must do guess work to figure out the center line of your brush strokes, and apply deformations on its shape as you tweak its control points. 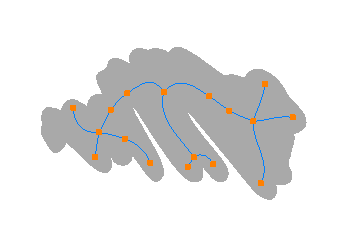 The Centerline Editor will not be able to make a clear center line out of brush strokes that merge together, that look scrambled or that do not have a clear direction. NOTEIf you use the Centerline Editor to deform a closed brush stroke with a fill inside it, the fill will not be reshaped to fit the new shape of the brush stroke. NOTETo learn more about the Centerline Editor tool options, see Centerline Editor Tool Properties.